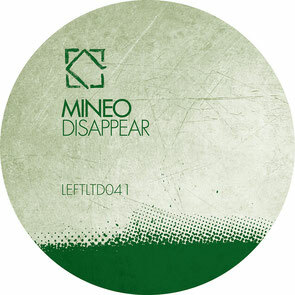 Leftroom Ltd kick starts 2015 with the ‘Disappear’ EP from Mineo, comprising three original tracks from the London-based producer. Mineo has done well over the past year having unleashed an array of material via the likes of Crosstown Rebels, Hot Creations, Hypercolour and Southern Fried Records. Here he adds Leftroom to his affiliations, offer up this new three-tracker via its Ltd sub-label. Mineo opens things up with title-cut ‘Disappear’, employing weighty rhythms and stuttering sub-bass tones to lay the foundations, while glitching synth licks instil an entrancing hooky feel, and an amalgamation of spoken-word vocal chops are intricately processed over the cut’s five and half minutes. Following is ‘Starts With A Kick’, taking things in a more stripped, understated direction with dreamy atmospherics and organic percussive lines running alongside whirring synth drones and Bhutanese vocal loops. Then last up to round off the package is ‘Starts With A Beat’ and as the name would suggest Mineo tips the focus on raw and gritty drum sounds here, while a sub-bass line hooks you in and keep you there for a near seven-minutes while murmuring vocals meander around the groove.